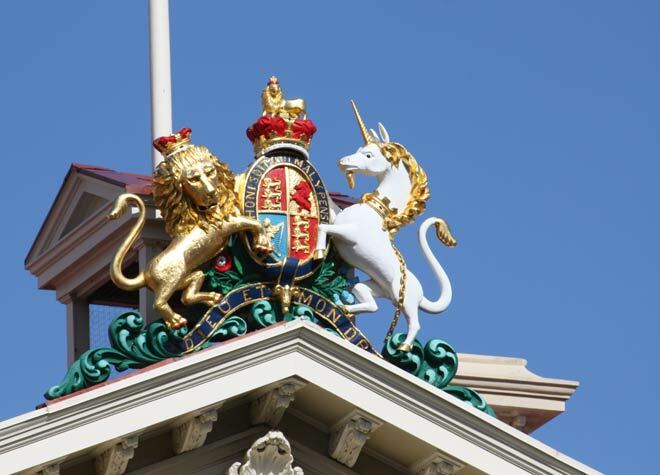 A carved and brightly painted version of the royal coat of arms – originally sculpted in 1910 – adorns the Old Government Buildings’ roof in Wellington. The buildings are now part of the Victoria University of Wellington law school, but were originally erected in the 1870s to house the New Zealand public service. At that time New Zealand did not have its own coat of arms and, as a colony of Britain, used the royal coat of arms instead. The French inscription in the scroll below the lion and the unicorn says ‘Dieu et mon droit’, which means ‘God and my right’.